On the fourth Thursday in November, families across the United States get together to feast on turkey and dressing, football and then leftovers! Kids begin to get excited for Christmas as they search for Santa during the Macy's Thanksgiving Day Parade, but did you ever wonder why these Thanksgiving traditions started? Turkey was not on the menu at the first Thanksgiving. Thanksgiving is the reason for TV dinners! In 1953, Swanson had so much extra turkey (260 tons) that a salesman told them they should package it onto aluminum trays with other sides like sweet potatoes — and the first TV dinner was born! 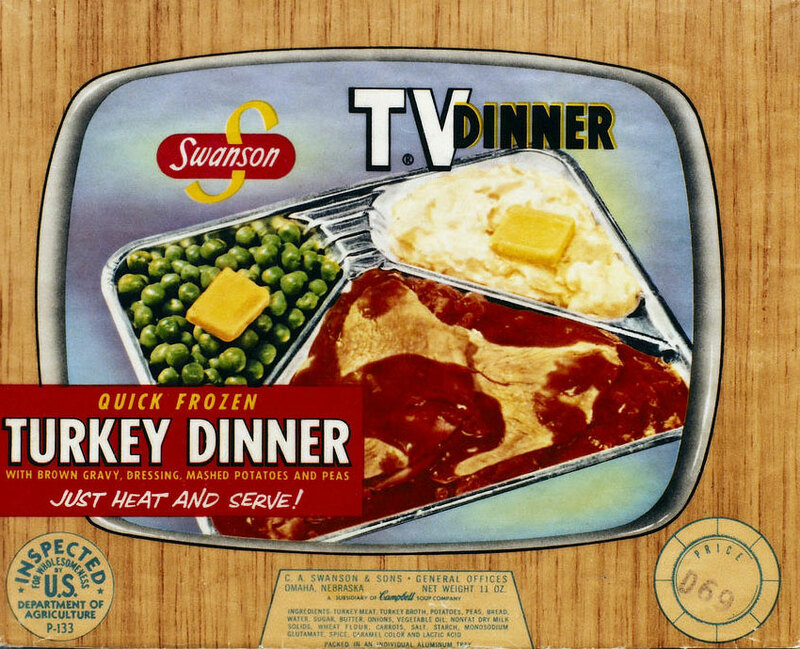 The first Swanson-brand TV Dinner was produced in the United States and consisted of a Thanksgiving meal of turkey, cornbread dressing, frozen peas and sweet potatoes that was packaged in a tray like those used at the time for airline food service. Each item was placed in its own compartment. The trays proved to be useful: the entire dinner could be removed from the outer packaging as a unit; the aluminum tray could be heated directly in the oven without any extra dishes; and one could eat the meal directly from the same tray. Can you imagine Thanksgiving without turkey? Well, if Benjamin Franklin had it his way we may not be eating turkey for Thanksgiving at all! According to a letter Benjamin Franklin wrote to his daughter in 1784 he wanted to make the wild turkey, not the bald eagle, the national bird of the United States! Roasted turkey was Neil Armstrong and Buzz Aldrin's first meal in space. The first meal enjoyed by US astronauts when they landed on the moon in 1969 was was foil packets with roasted turkey and all the trimmings. Thanksgiving is always on the the fourth Thursday in November. President Abe Lincoln proclaimed Thanksgiving would be the fourth Thursday in November, but in 1939 President Roosevelt moved it up a week hoping it would help the shopping season during the Depression era. It never caught on and it was changed back two years later.